I have a similarly sweeping statement about those of Italian descent and lasagna: the version you grew up with is the best there is. Sure, you might go to a fantastic restaurant, or eat dinner at a friend’s who really knows how to cook, but their lasagna, no matter how delicious, just isn’t as good as the one you know. This is how I feel about my lasagna. Yes, I’ve had other versions — really delicious versions! — but they weren’t mine, so they weren’t the best. Ironically, the recipe doesn’t come from my Dad’s (Italian) side, but my mother’s (Irish) side. My mom’s aunt by marriage (Aunt Ann, who, um, happened to be German) picked up this recipe from her days cooking in a school cafeteria in Queens, NY. This was during the days when cafeterias actually cooked food as one might at home, though on an admittedly larger scale. I feel a little sheepish admitting this lasagna’s pedigree (Irish? German? CAFETERIA?!?) but, who knows — maybe Aunt Ann got the recipe came from an Italian woman who worked alongside her. Plus, it’s a damn fine lasagna. In any event, I didn’t find out this story until I was in college, and by then my love for it had been long cemented. I hope you enjoy it. This lasagna always tastes better the next day. You may assemble the lasagna a day ahead with stellar results. Leftovers reheat nicely in the microwave, but I like to eat it cold, too. Preheat oven to 375-degrees F. Cook pasta per package directions, being careful not to overcook. Drain, then place back in the pot adding cold water to stop cooking process and prevent the pasta from sticking together. While the pasta is cooking, in a large frying pan, brown the ground beef over medium, removing cooked meat with a slotted spoon to a small bowl. Drain all but 1 1/2 TBS of fat from the pan. Add onion, cooking until translucent. Toss in minced garlic and cook briefly. Put meat back in pan, mix well, then add in sauce. Drain pasta well (I use my index and middle fingers as a squeegee to help get rid of excess water). In the bottom of a 9×13 baking dish, spread a bit of the reserved marinara sauce, then lay down the first layer of lasagna, overlapping the edges. Add a layer of the meat sauce (about 1/3), spreading well to cover the noodles. Add the ricotta (again 1/3 of the total) dropped from a tablespoon in an even but random pattern. Top this off with a scattering of mozzarella cheese (about 1/4 the total amount). Repeat this process two more times, layering the lasagna in alternate directions and tucking in the edges, until complete. 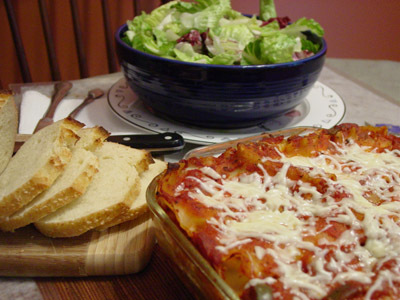 Top the final “uncovered” layer with lasagna noodles, and lightly cover with marinara sauce. Cover with foil and bake for 30 minutes, or until hot in the center. Remove foil, sprinkle with additional mozzarella cheese, and bake another 5 minutes. Let stand for 5 to 10 minutes before serving.